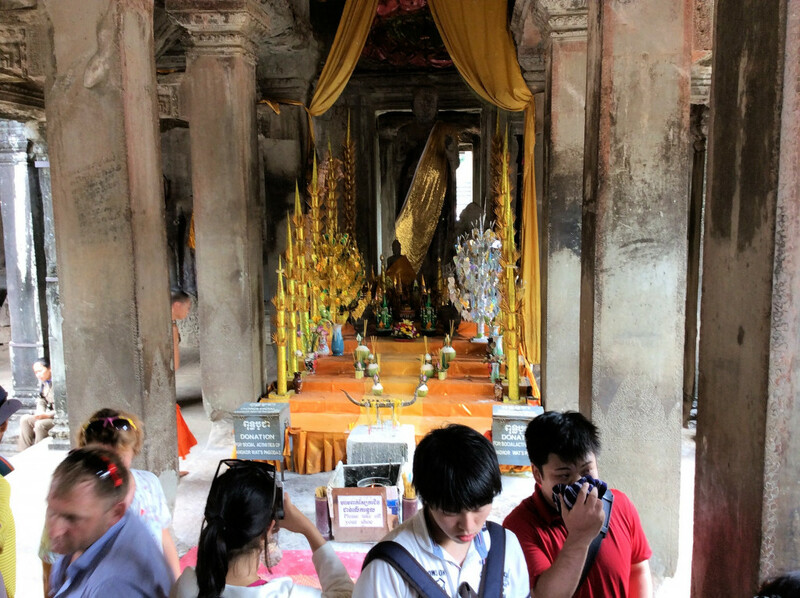 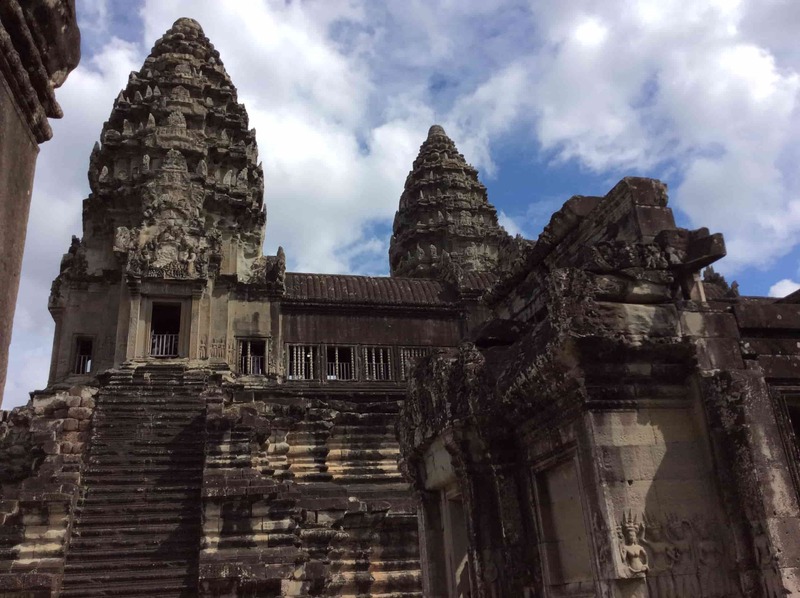 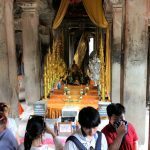 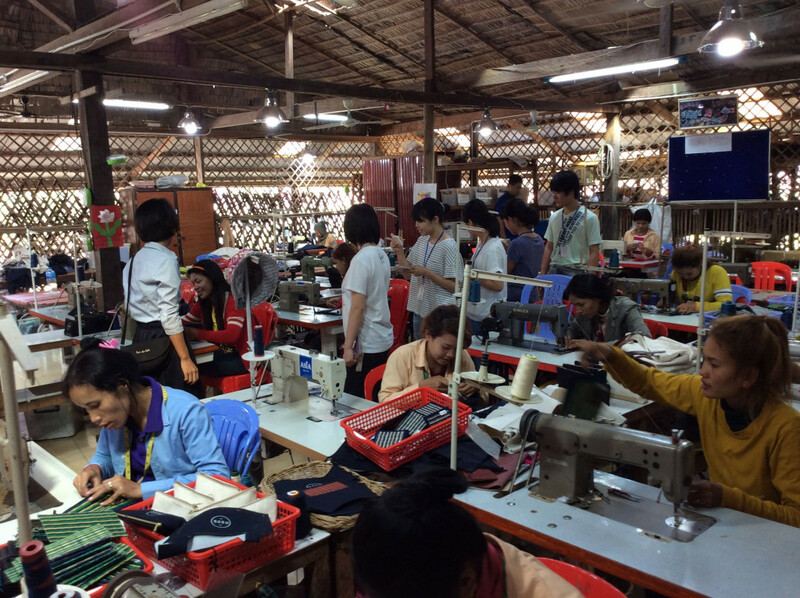 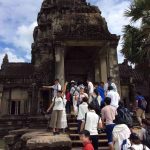 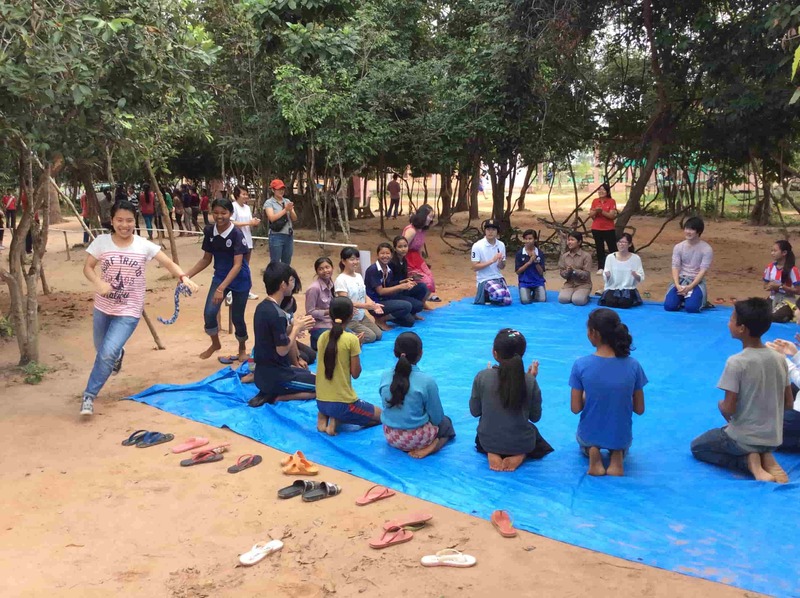 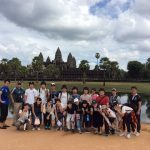 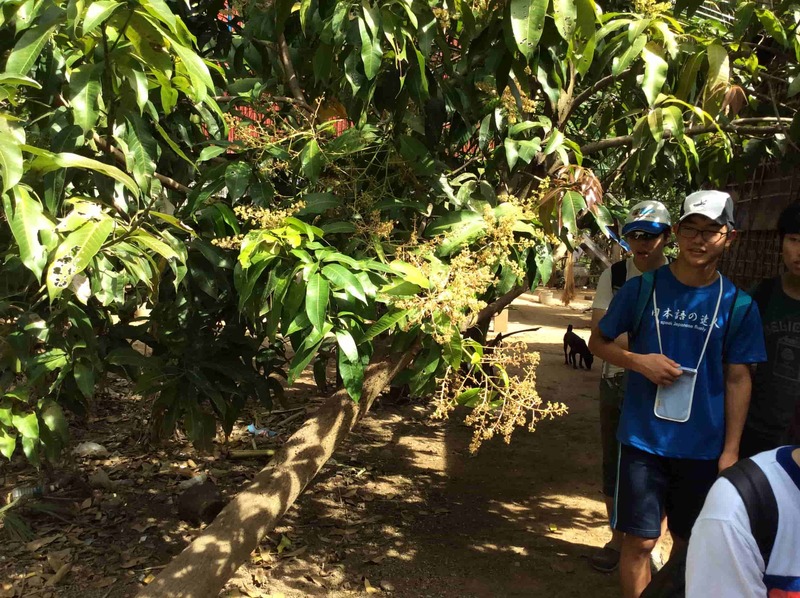 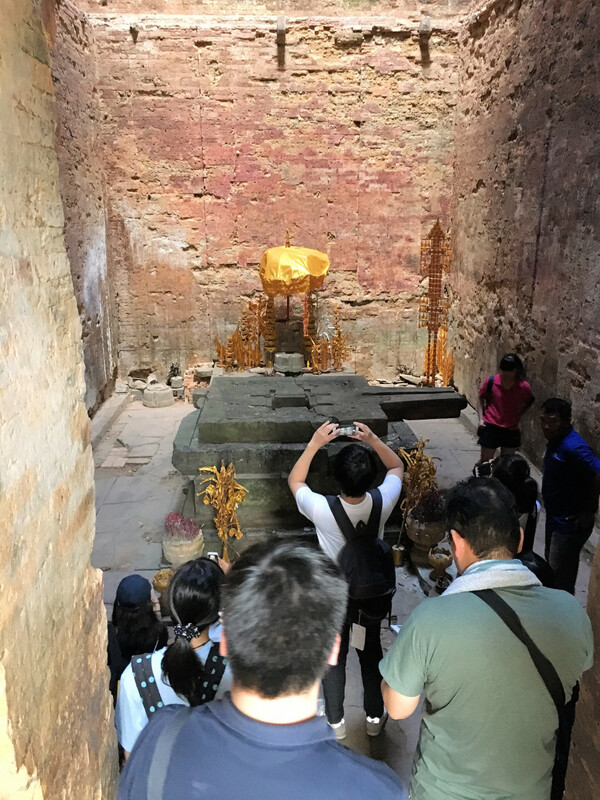 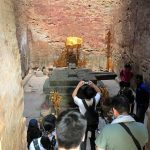 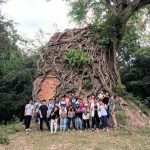 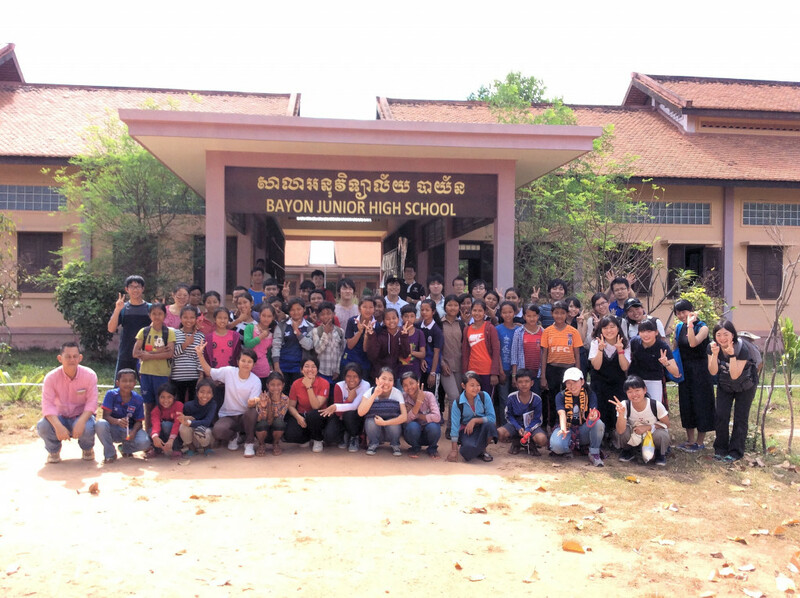 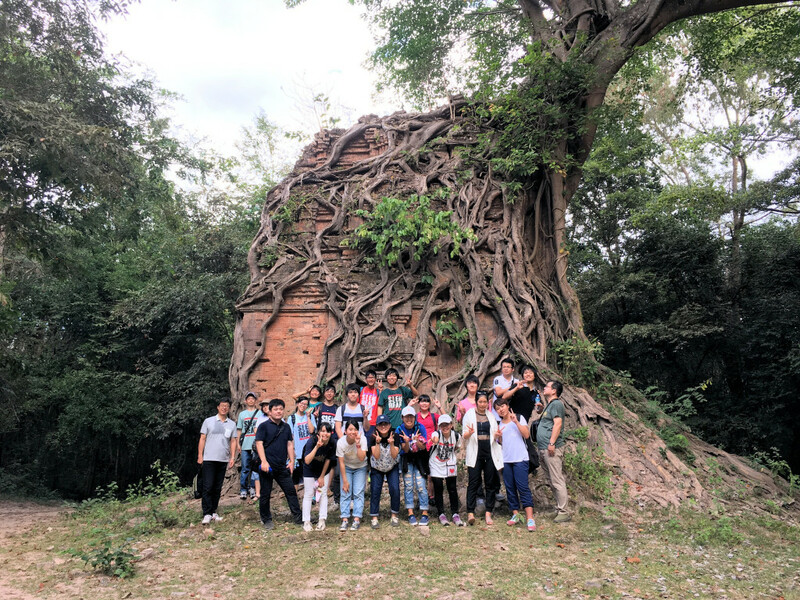 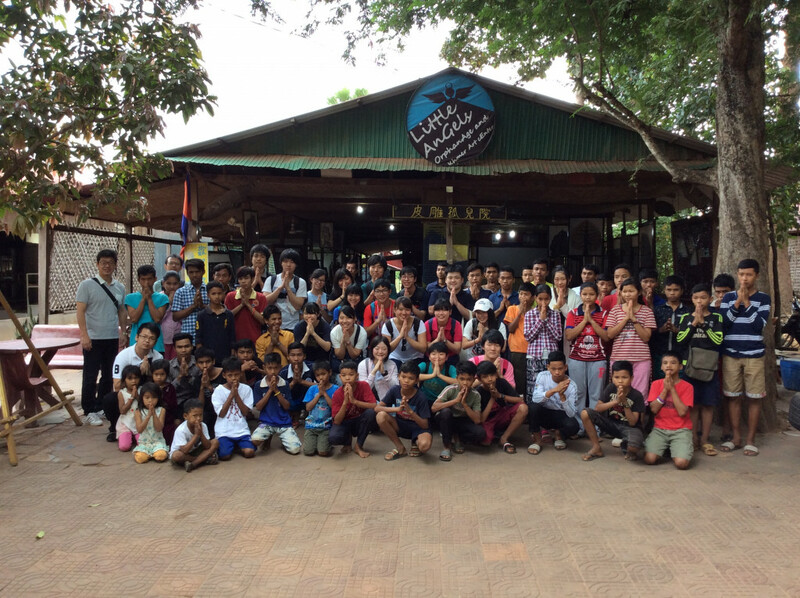 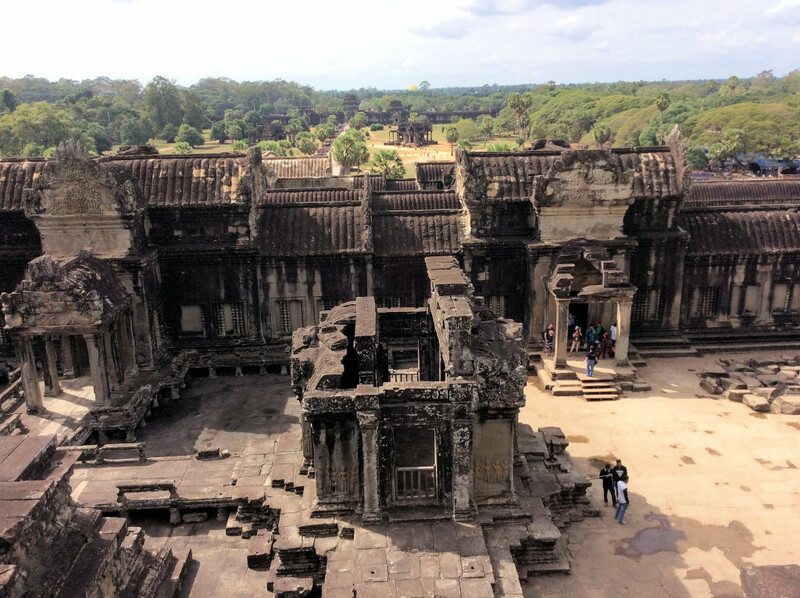 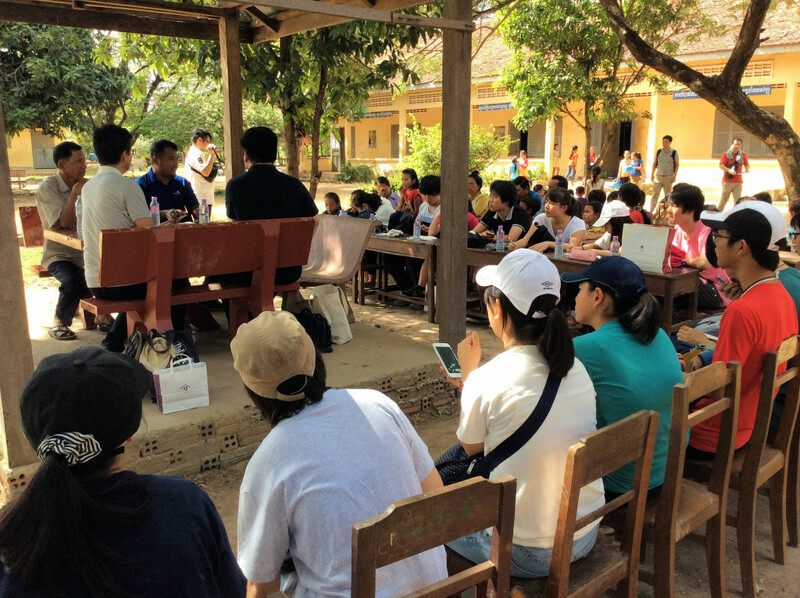 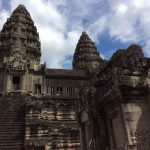 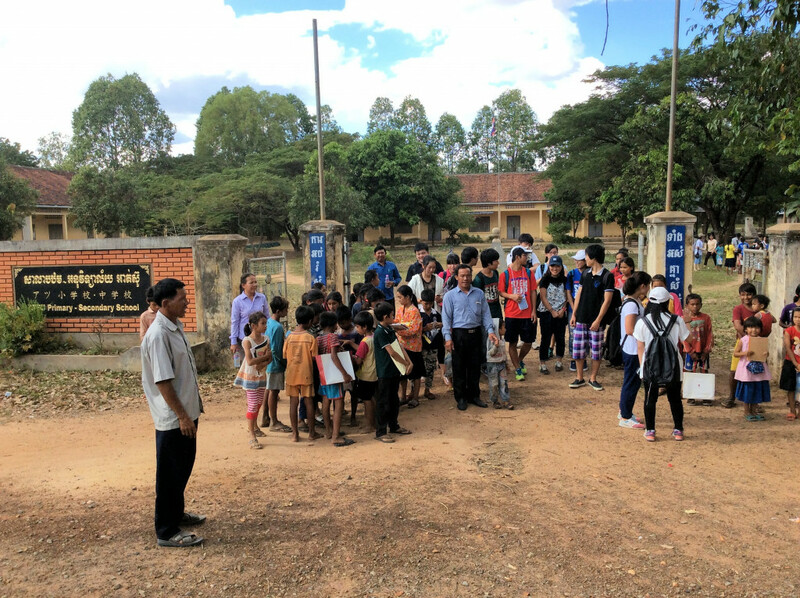 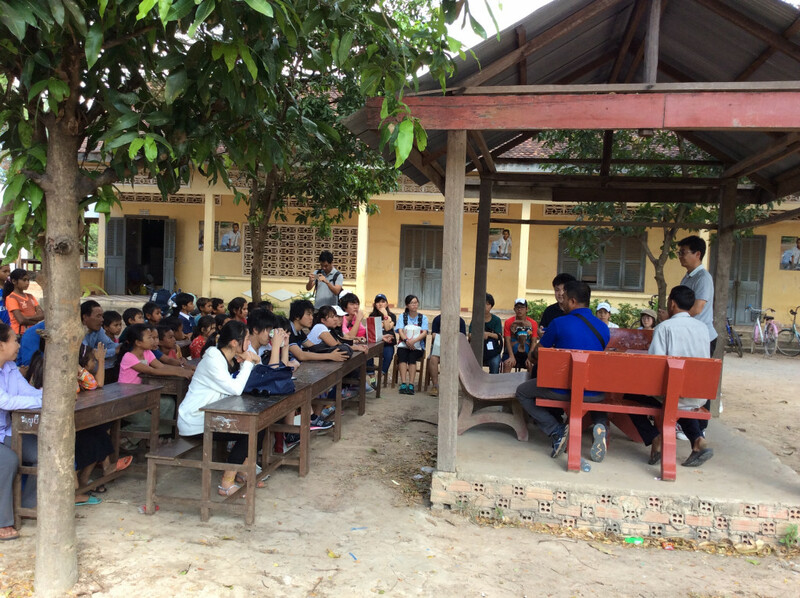 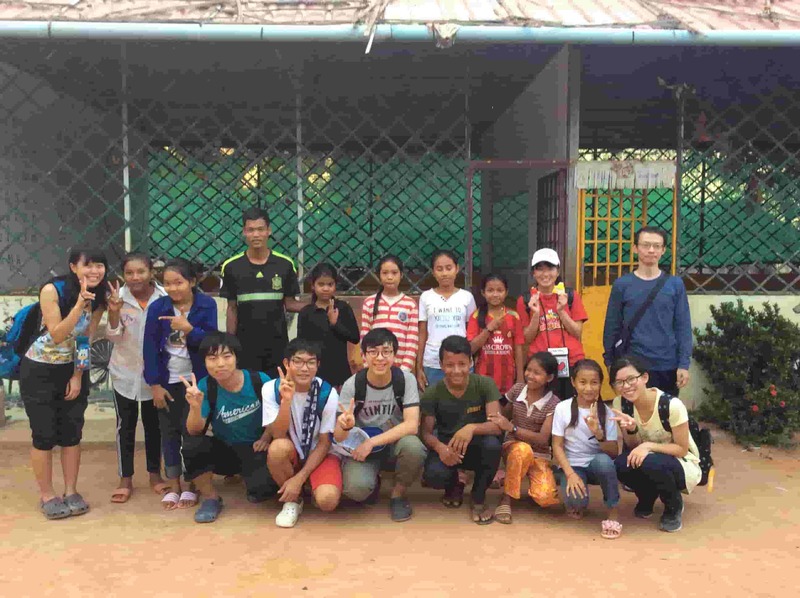 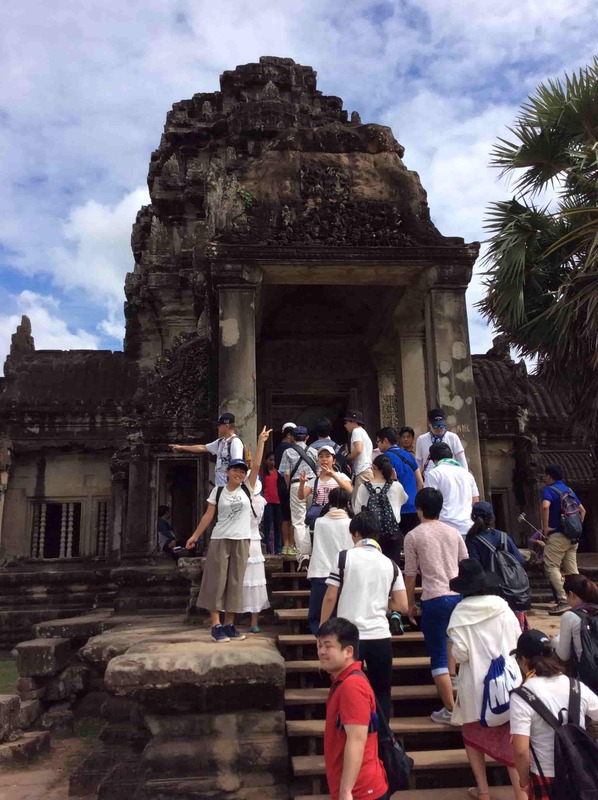 17 second year students visited Siem Reap in Cambodia from January 4th (Wednesday) to January 9th (Monday). 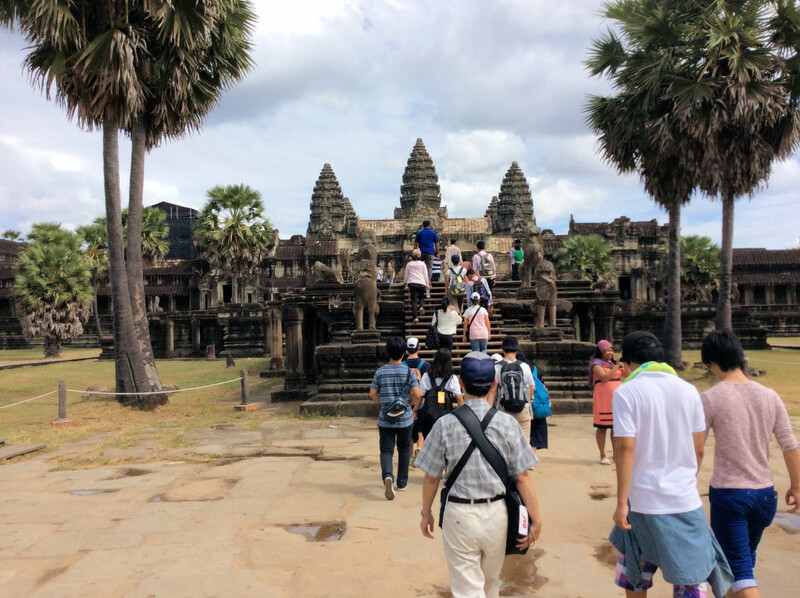 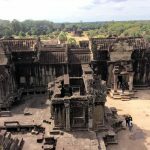 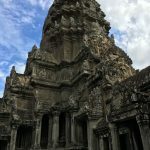 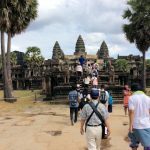 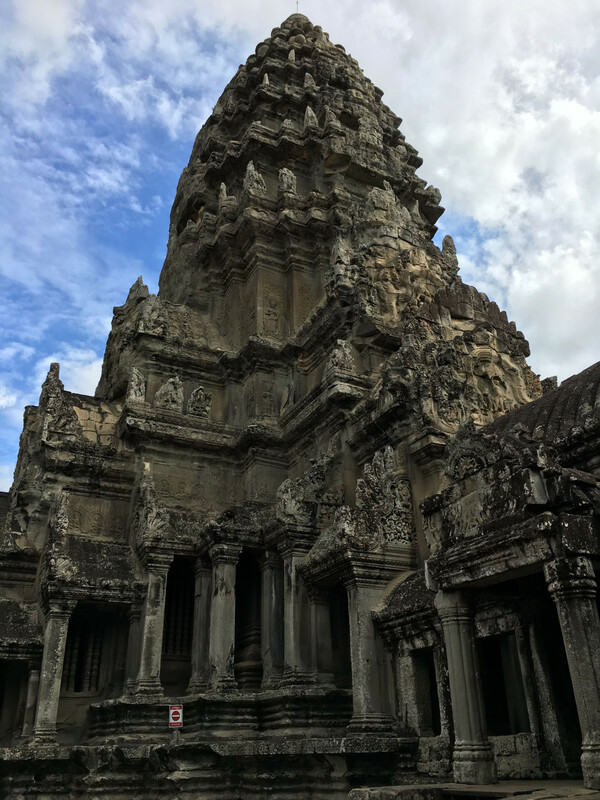 Traveled from Kansai International Airport to Siem Reap with a layover in Hanoi. 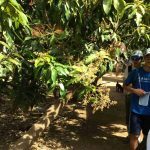 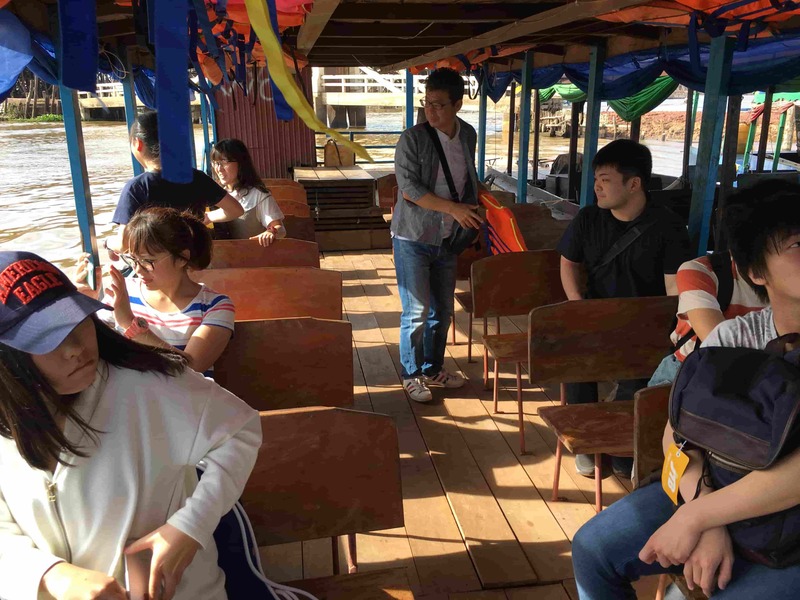 The 17 students participated in one of three courses, A, B or C. Over a period of two days they remained with their groups and conducted various activities in their designated locations. 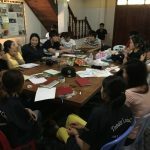 Kumae is a general incorporated foundation that was established in August of 2013 with the goal of improving the living and educational standards of the workers of the Siem Reap garbage treatment center by providing job opportunities a with banana paper making business and children’s educational projects. 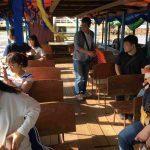 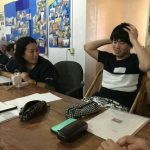 On the 5th, the students listened to representative director Takuya Yamase’s presentation on Kumae’s activities and visited the garbage heaps. 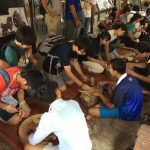 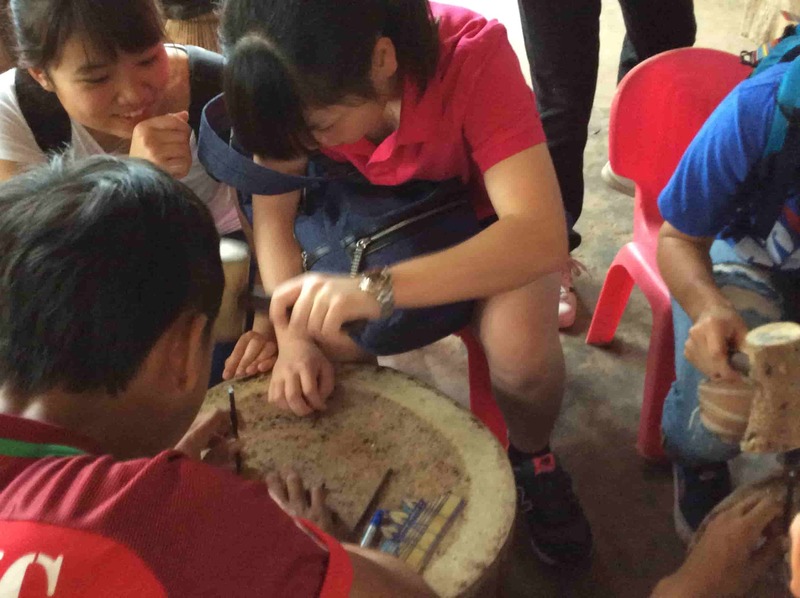 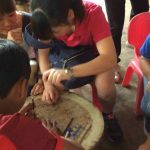 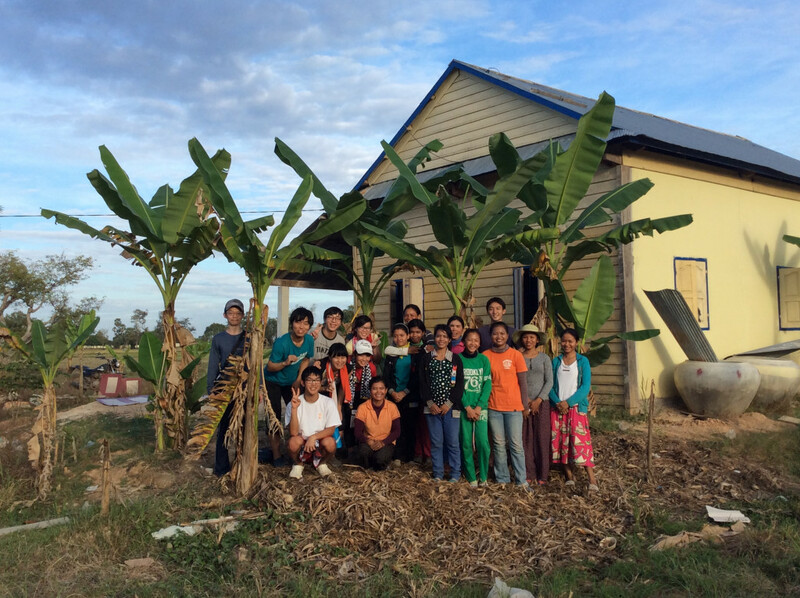 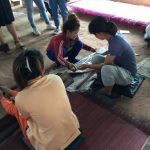 In the afternoon, they learned how to turn the banana skin fibers into pulp as well as the way to make the oven that is necessary for creating banana paper. 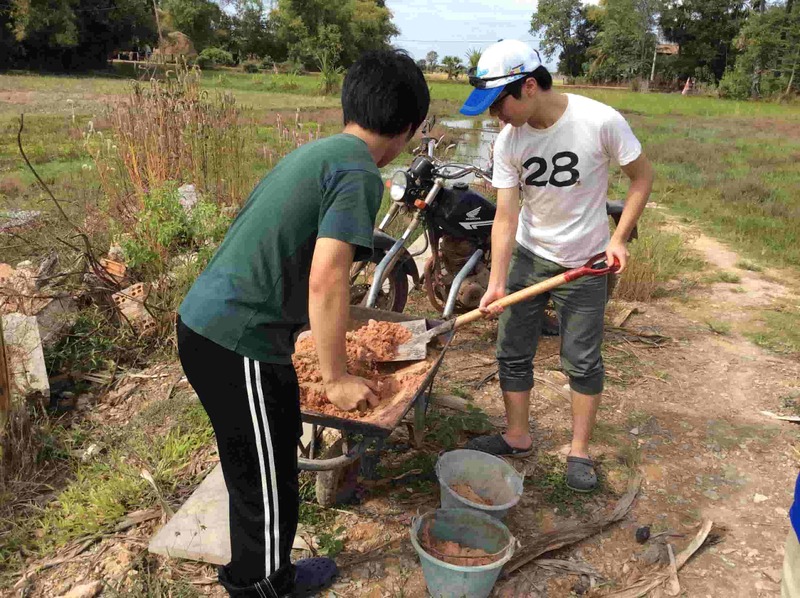 The banana fibers were hard and it was hard work stepping on the mortars that would crush them. 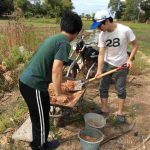 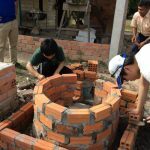 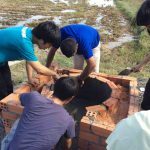 For the oven, the students kneaded cement and laid the resulting bricks. 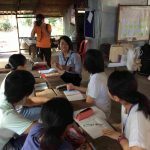 In the evening, we visited the Japanese school where Mr. Yamase is a teacher. 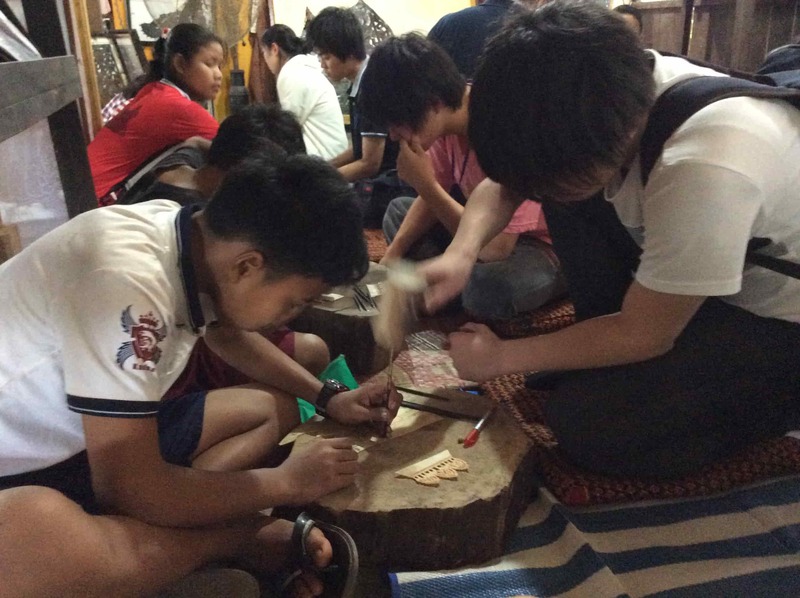 On the 6th, the students used thin hard fibers from the day before to make banana paper. 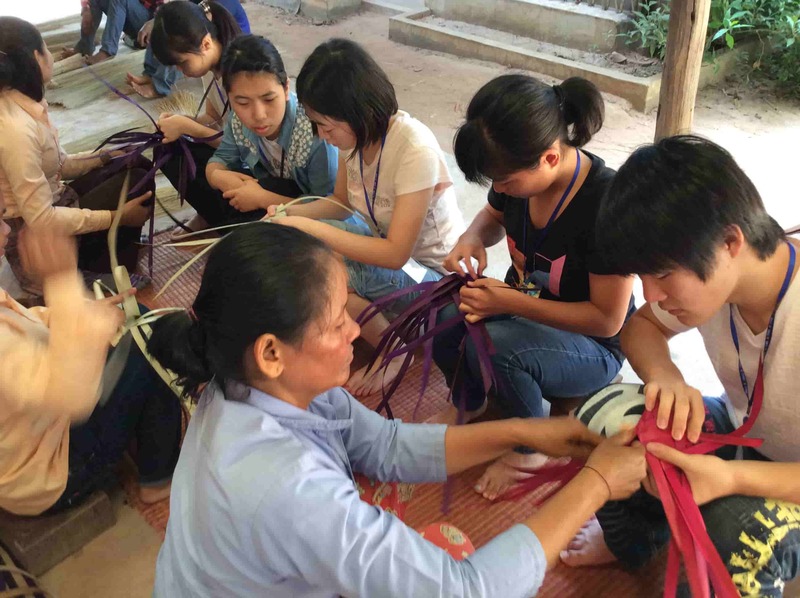 Because it was their first time doing such work, it was difficult for them to make the paper. 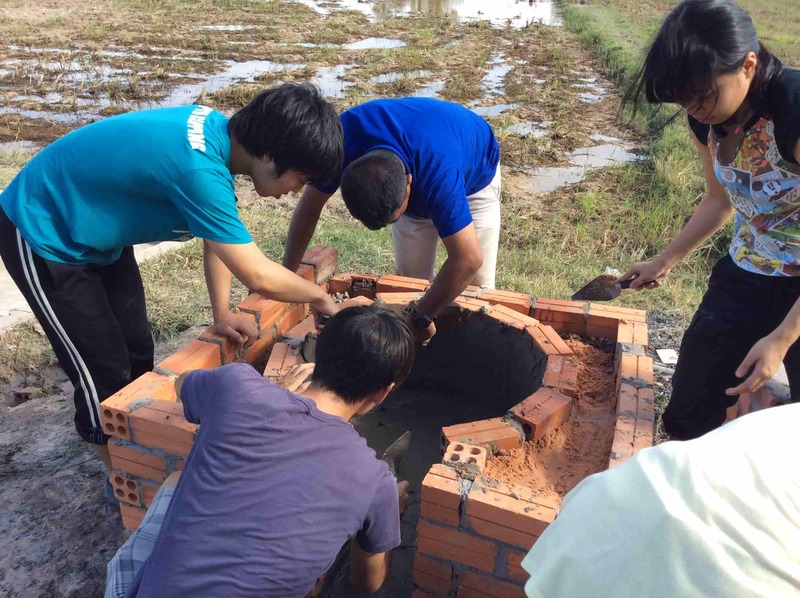 Again, following the day before the students worked on building the oven. 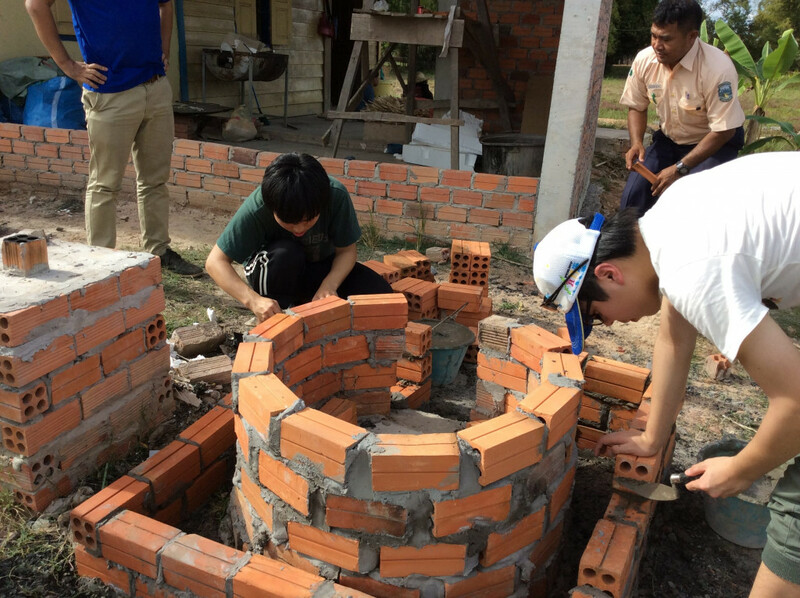 There was only one pot that could boil the banana skins, but the pot that the students made also ended being used. 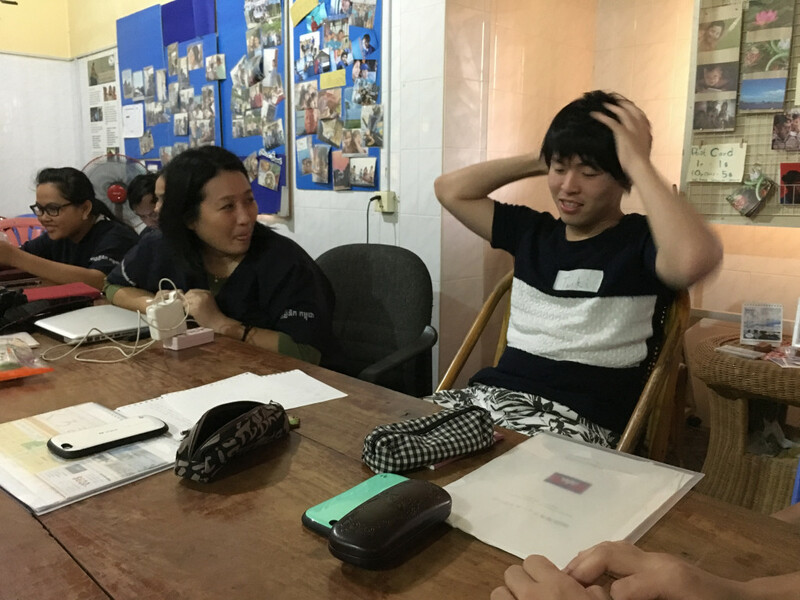 In the evening, we visited the Japanese school again. 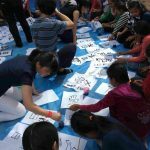 At the Japanese school, we talked with 10 middle-school aged students and taught them how to play the Japanese game of Karuta. 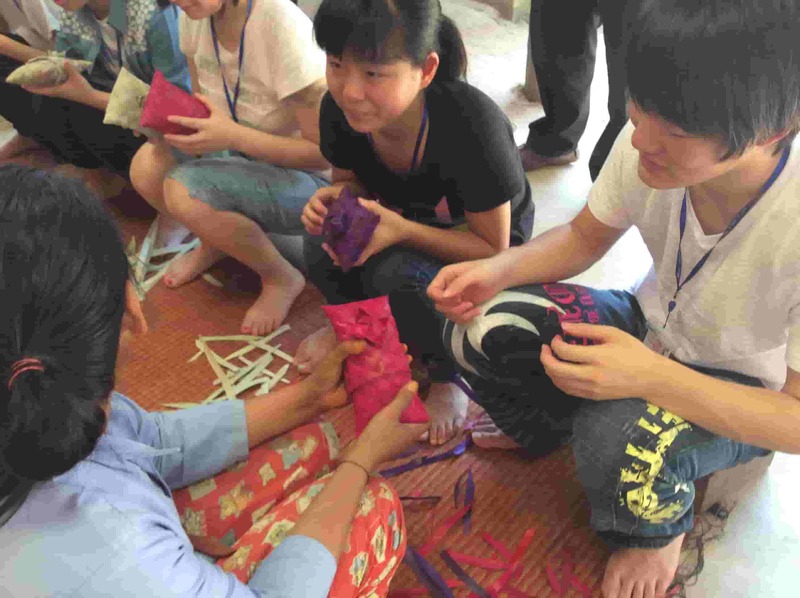 “Kamonohashi” is a community factory that helps support villager women who are living in poverty by teaching them the skills necessary for creating folk craft goods so that they can become economically independent. 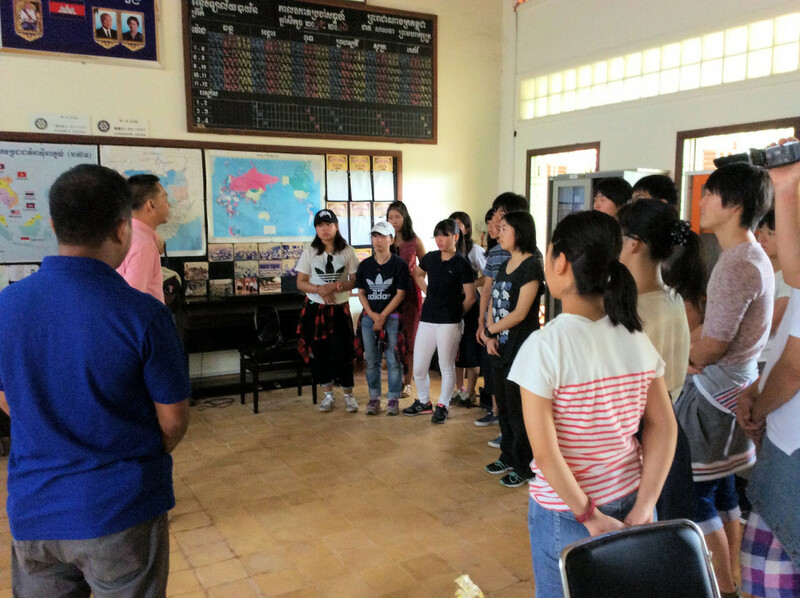 On the morning of the 5th, the students participated in a presentation and tour of the facilities. 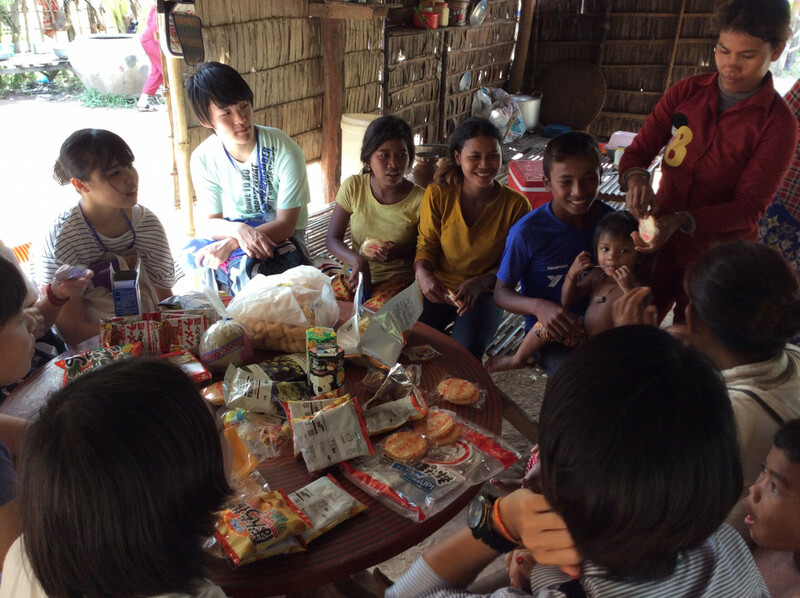 In the afternoon they visited the female workers and saw how they lived. 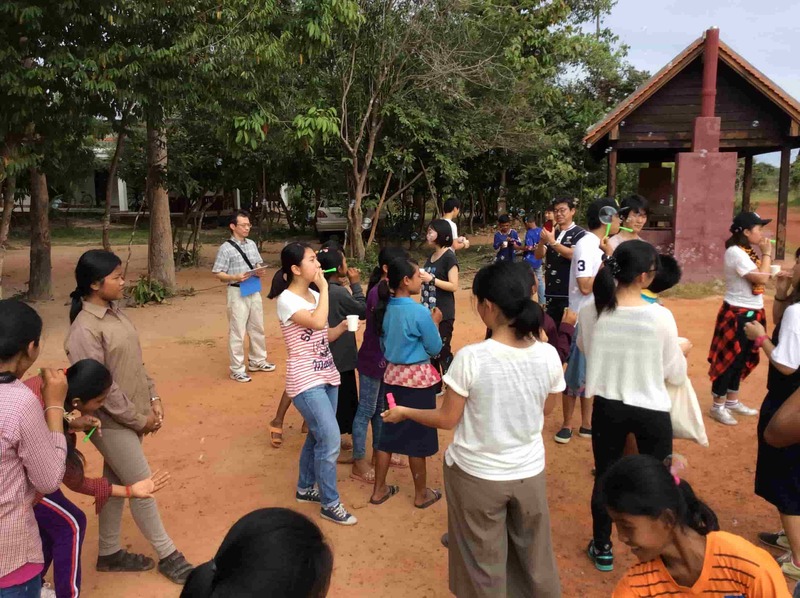 We also had a time of discussion with the villagers. 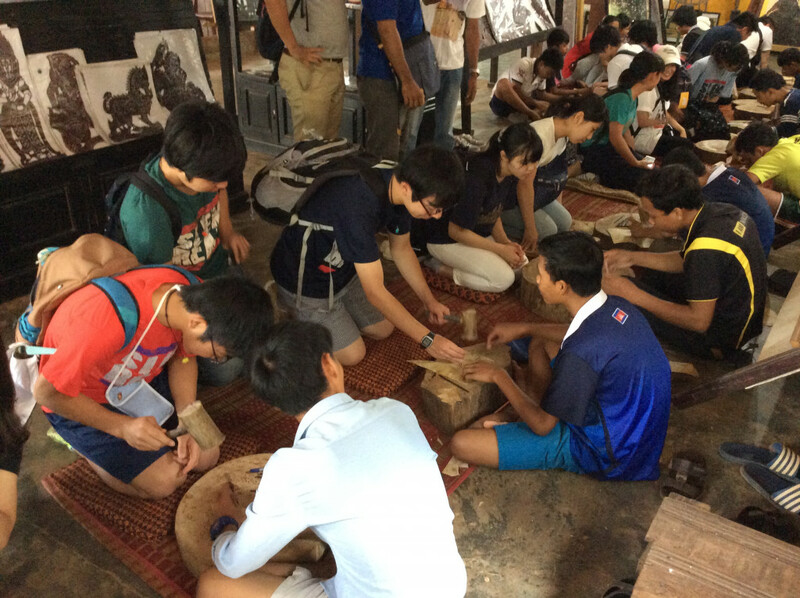 On the 6th, the students learned how to make a type of box using palm leaves from one of the female staff members. 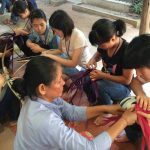 The workwomen not only worked but also were recieving reading, writing and problem solving life-skill training. 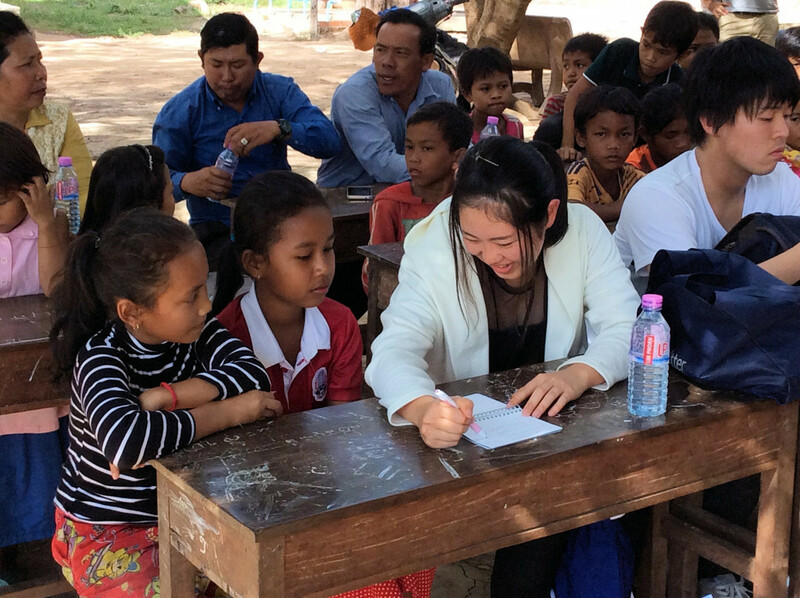 They hoped one day to work at a different kind of job. 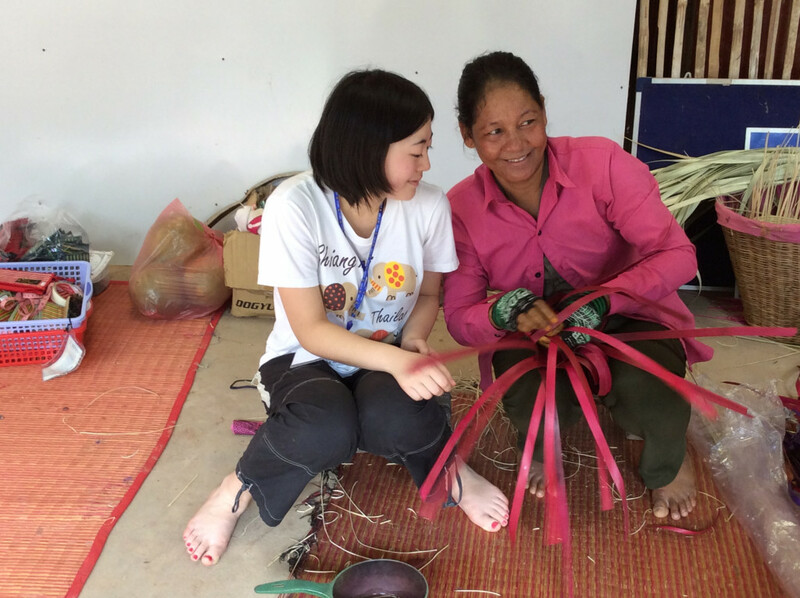 Being able to actually speak to these working women was very educational. 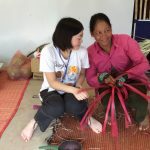 The image of these women who cared for their families while holding to their dreams and working with smiles on their faces was very impressive. 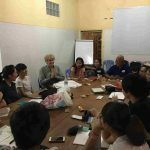 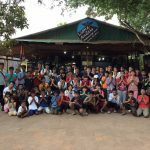 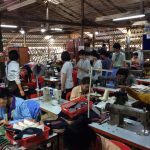 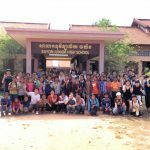 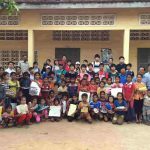 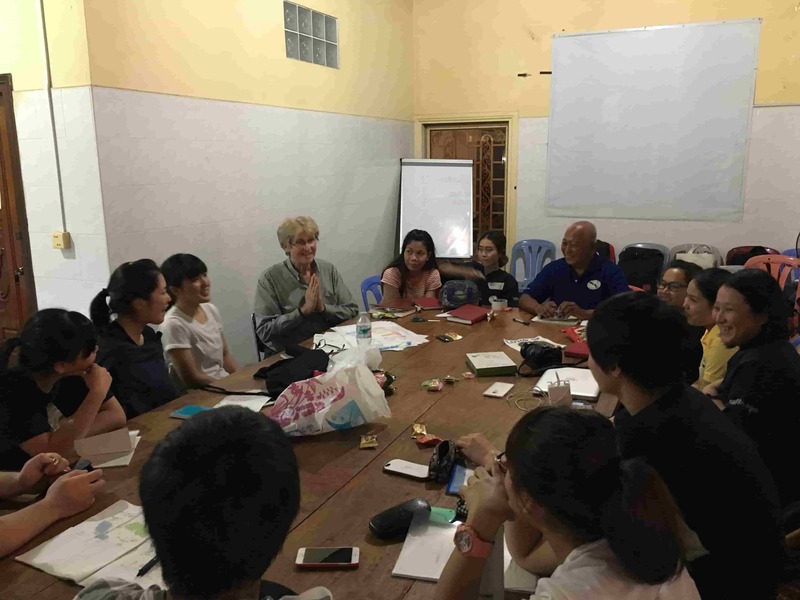 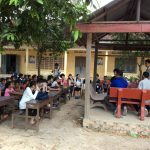 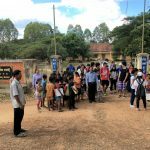 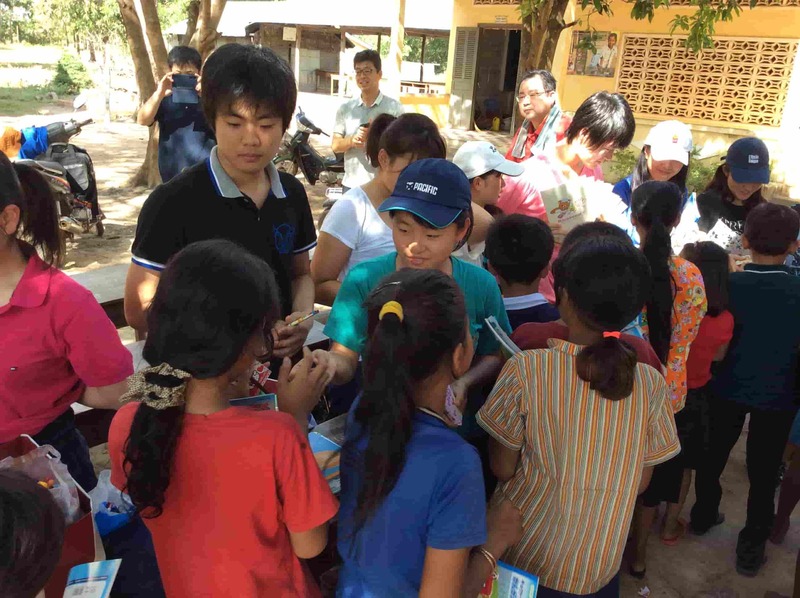 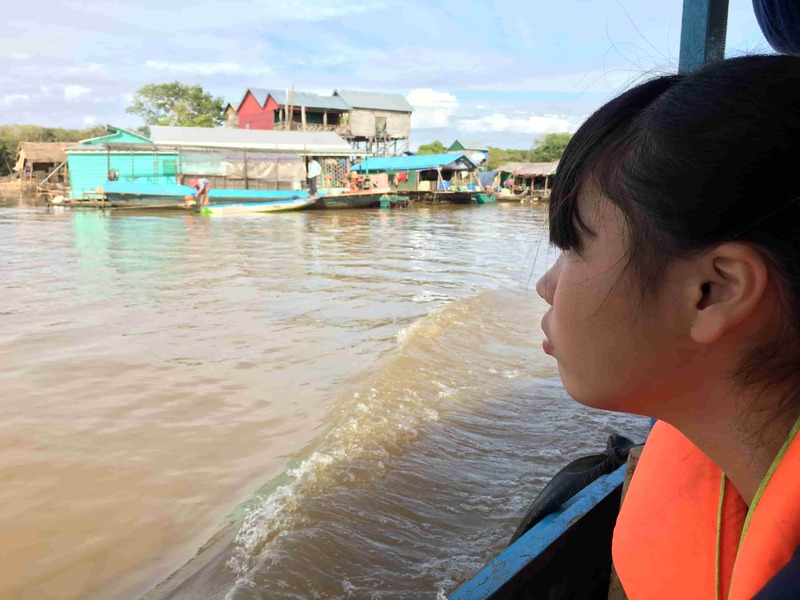 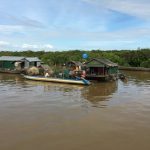 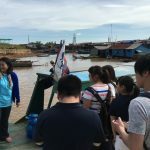 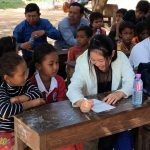 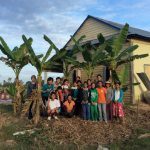 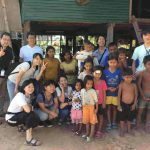 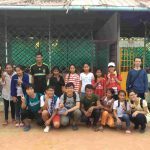 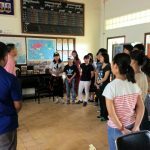 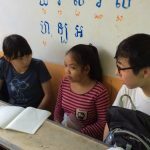 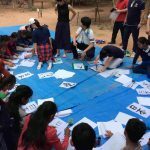 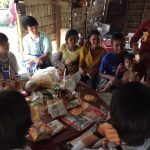 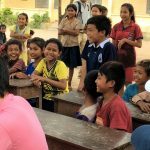 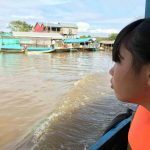 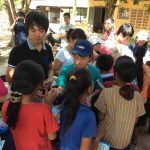 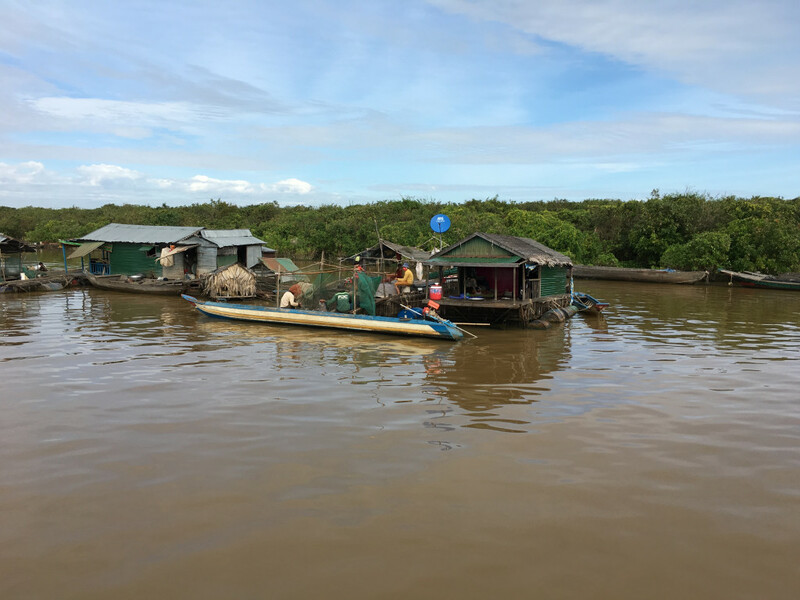 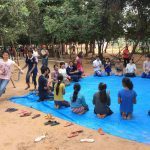 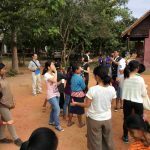 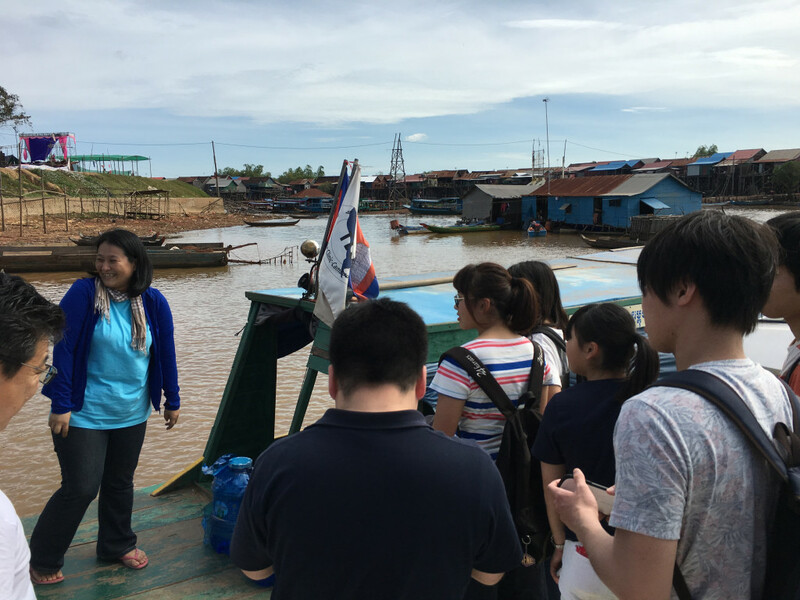 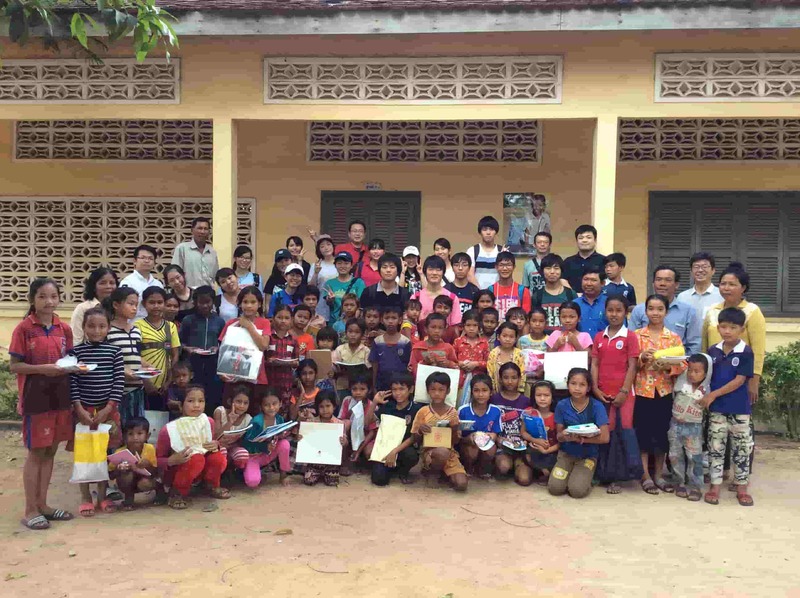 TLC (The Lake Clinic－Cambodia) is a NGO located in an isolated region of the Lake Tonlé Sap area that provides medical care and health education services. 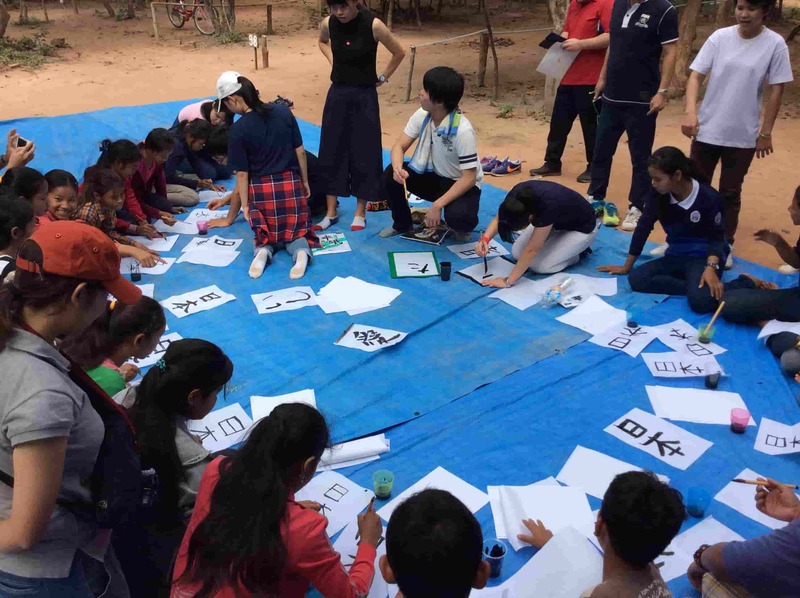 On the 5th the student performed two apron theater shows (“The influences of smoking” and “Digestion and nutrition”) and one picture-card show (“Let’s brush our teeth”) for the staff members and received their advice. 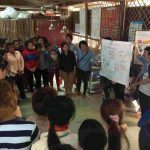 They then used that advice to refine and practice their performances for the shows that they would perform for the locals the following day. 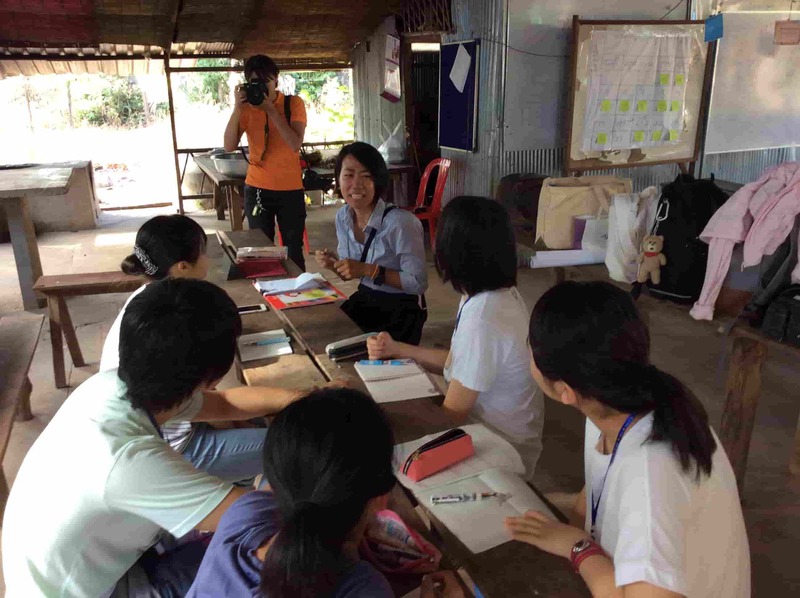 On the 6th, the students performed the apron theater and picture-card shows for the local staff members. 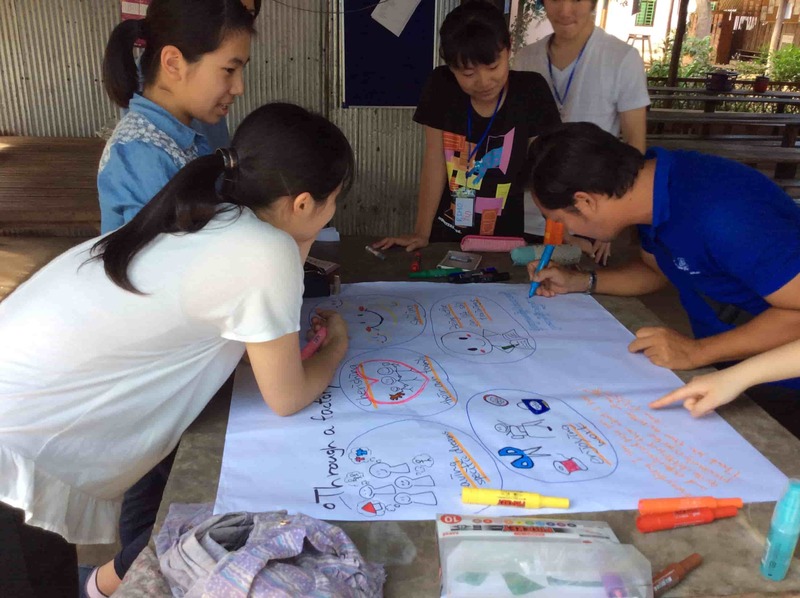 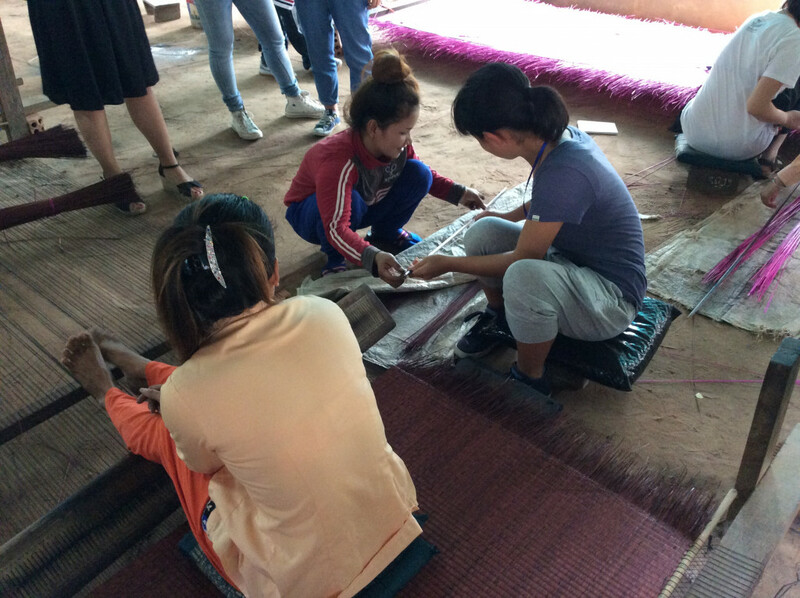 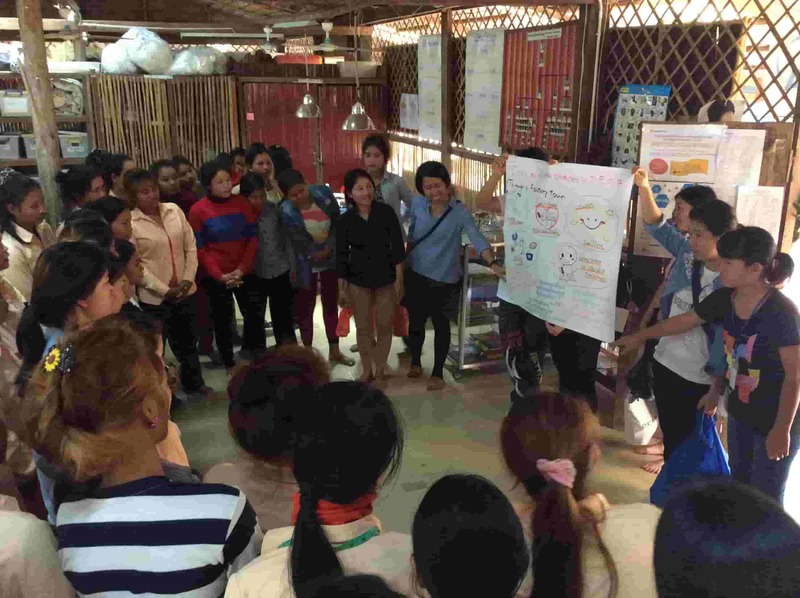 Following this, the staff members made a presentation in Khmer using our students’ aprons and picture cards. 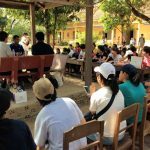 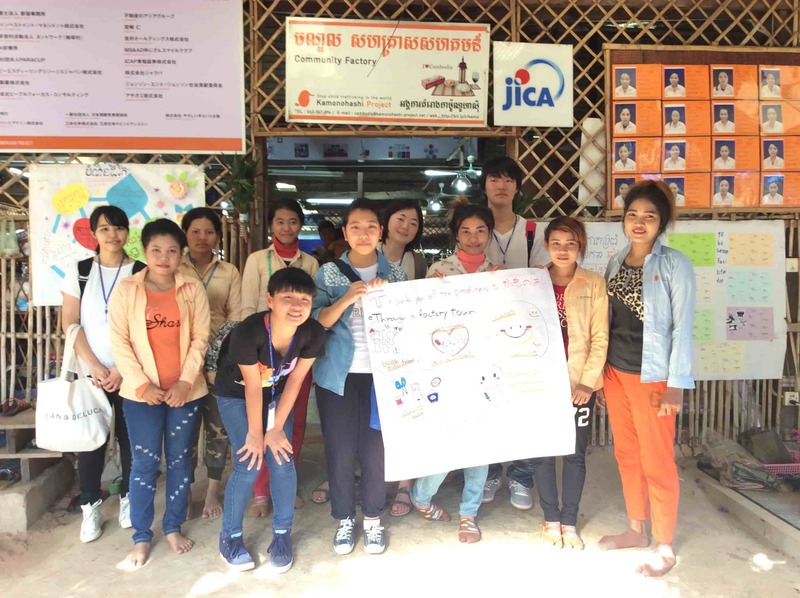 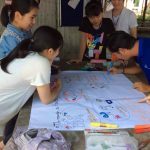 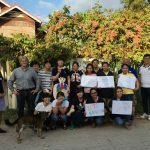 The presentations using aprons and picture-cards that our students had created were a new experience for the Cambodian locals and the contents of the shows were very well-received. 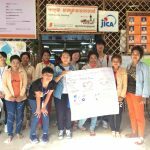 The staff members decided to use these presentations for the health education lessons were being held for the local children. 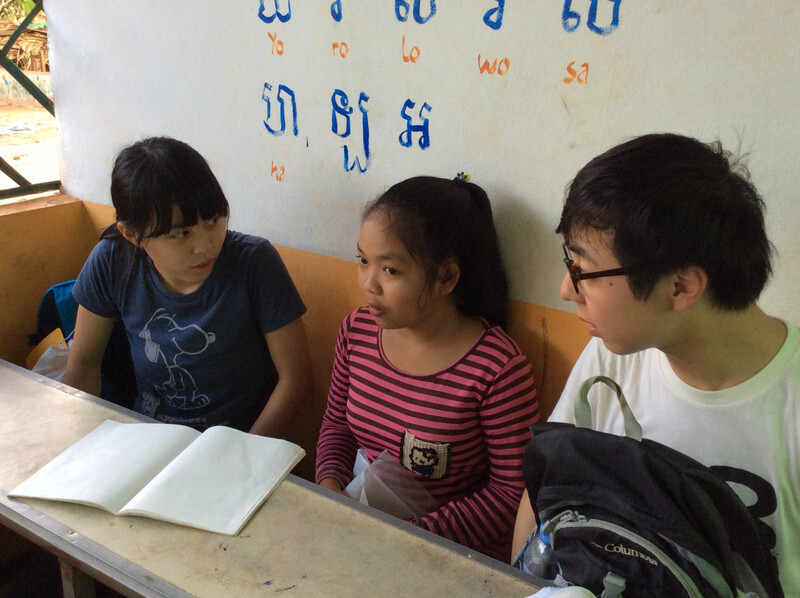 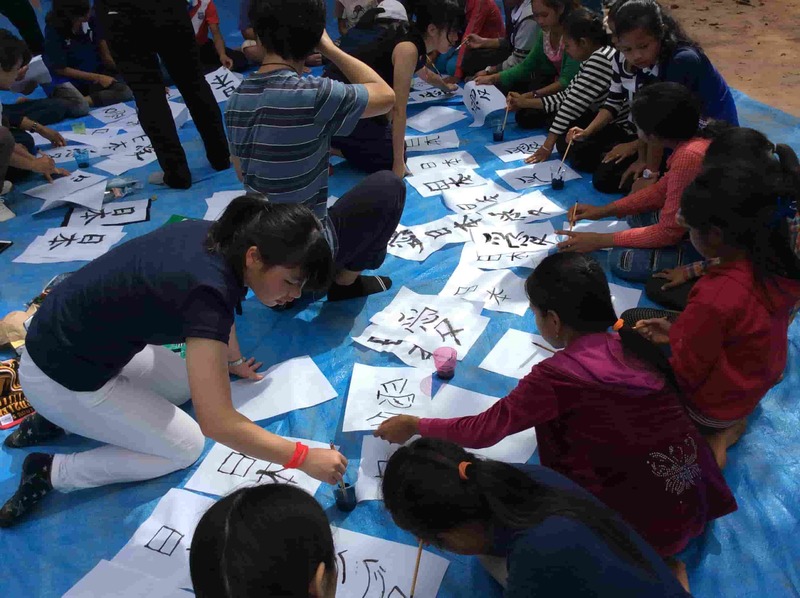 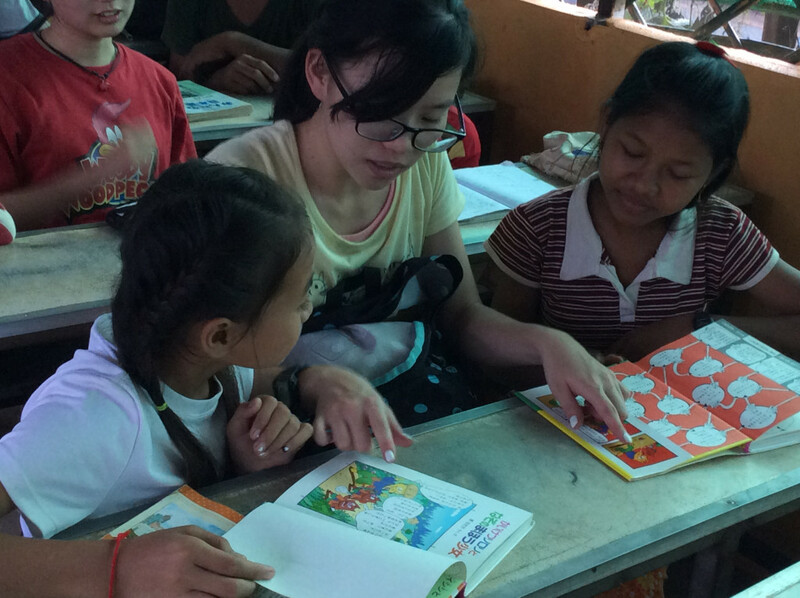 We learned how to overcome the language barrier and communicate with children who could not speak English. 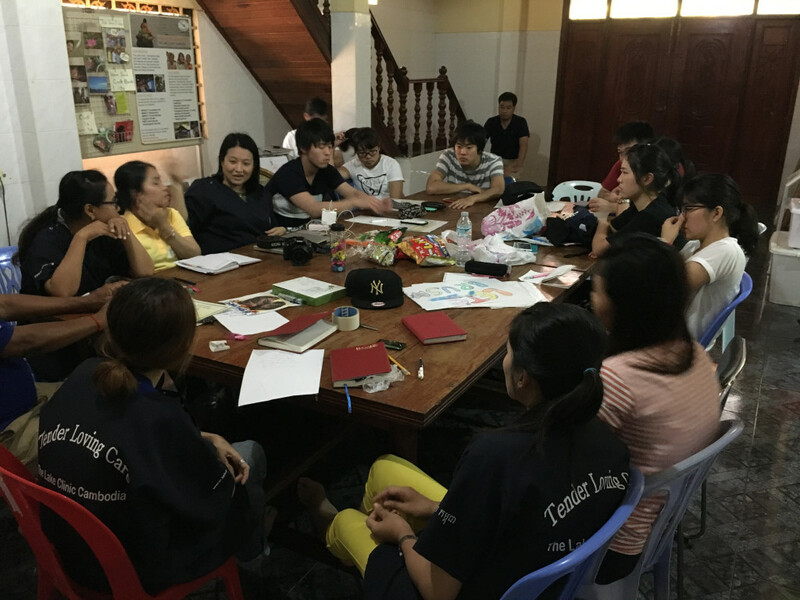 We realized how shortsighted we were when trying to communicate with people of a completely different culture from us. 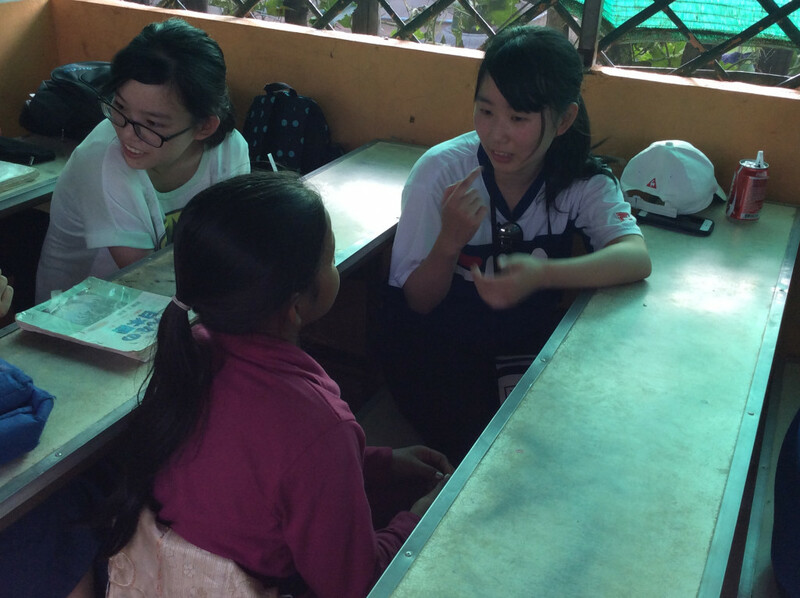 We felt comforted whenever we met someone who could speak Japanese. 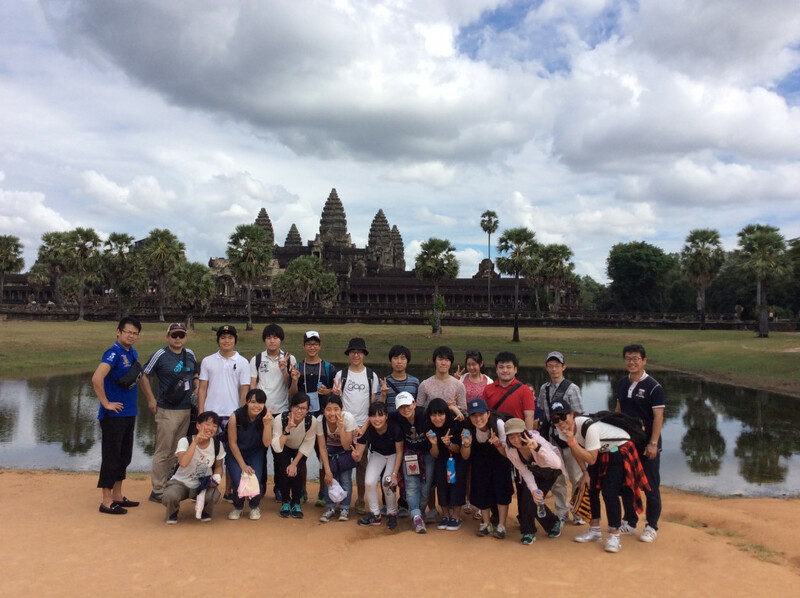 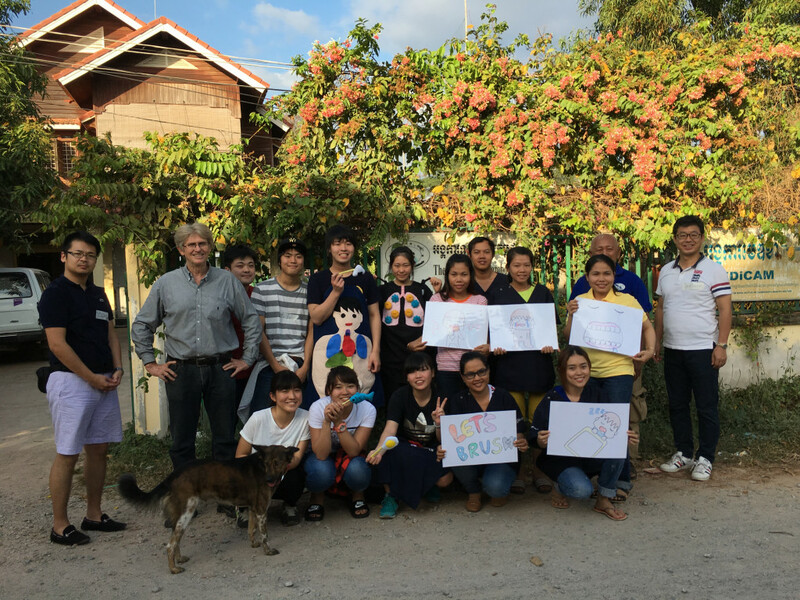 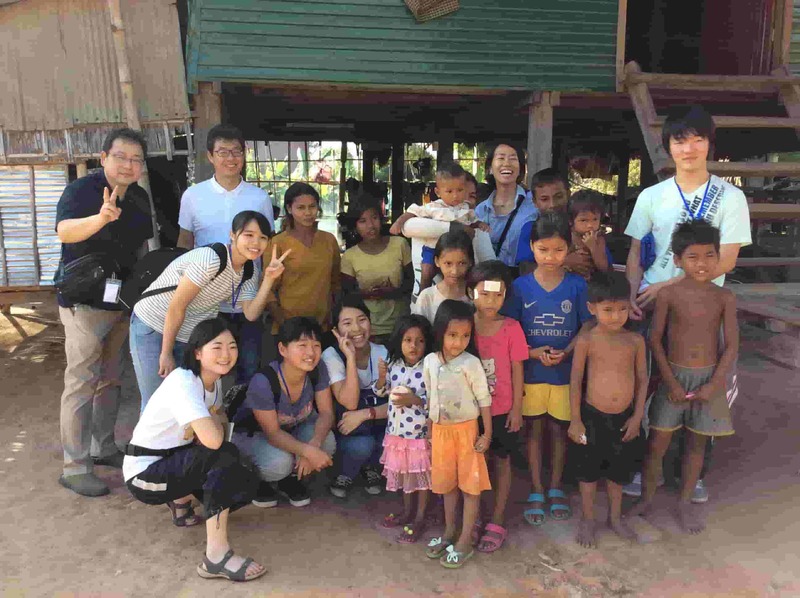 We were able to see the similarities and difference with both Japan and Thailand. 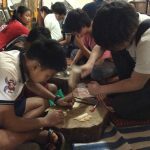 We hope that this will enrich the students’ research projects.